Clear for the PRA mutation NHPH4. 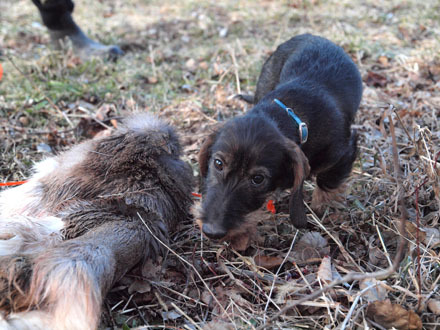 Sky is an AKC Field Champion; he also passed NATC/DTK Small Game Hunting Test and Gun Shyness Test. 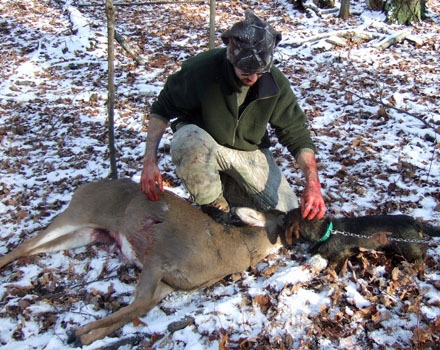 He has been certified by Deer Search on a 20-hour-old blood line (April 6, 2013, Prize III, 67 points). Sky has a strong hunting drive and opens freely on live game such as rabbits. He has not had many opportunities to prove himself as a natural blood tracker, but on the basis of his training work, we expect him to become one of our top males in the future. He shows excellent line sense and tracking desire. 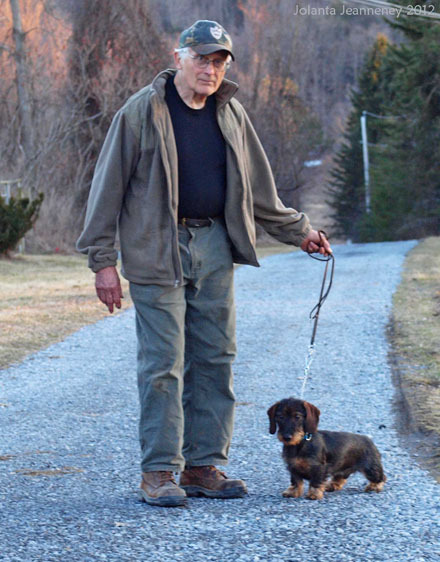 We have had him on a natural line with almost no blood, and he worked it as if he had been doing it all his life. One very important point is that Sky has a number of siblings from two litters who have become exceptional tracking dogs at a young age (for example Theo, Thor, Storm aka Tucker and Tarah). We believe that Sky is in the same league and will transmit the family genetics to his own offspring. Sky is a very handsome young dog. 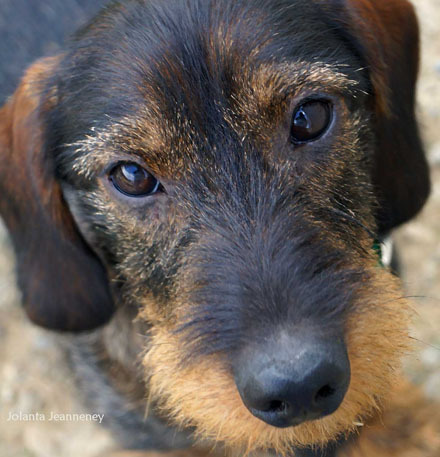 We are not show breeders, but we usually enter some of our dogs in the North American Teckel Club’s Breed Shows. 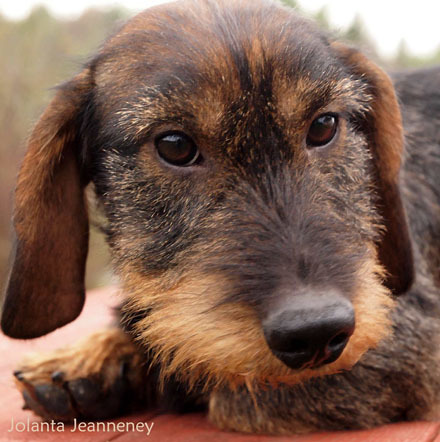 These shows are judged by German or European judges in accordance with the FCI standard that favors a leaner, more agile dachshund than what AKC judges prefer. 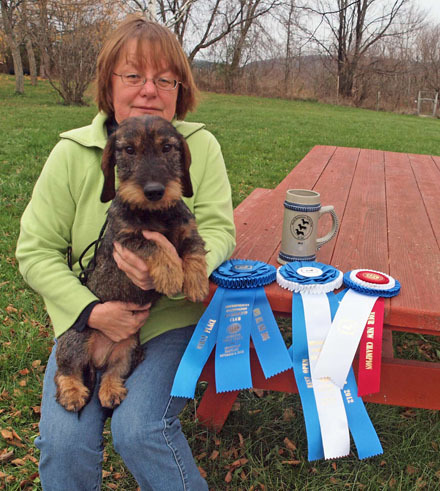 On November 2, 2012, at the NATC Zuchtschau in, Maryland, the German judge Monika Wittkamp selected Sky as “Best in Show”. Sky is very correct and easy on the eyes. And we suspect that he snowed the judge with his warm, friendly personality. His temperament is outstanding, and he has a strong desire to please and work in partnership with his handler. 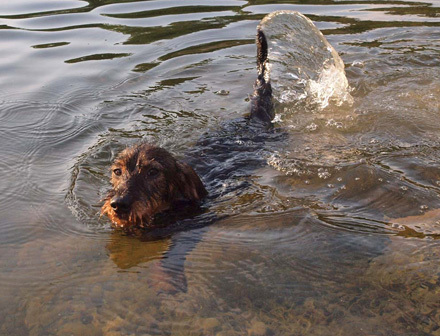 Last summer he showed us that he enjoys swimming in the pond. 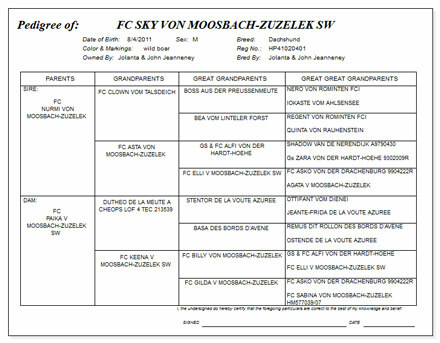 When you look at the pedigree of Sky von Moosbach-Zuzelek, he is a product of our own breeding. His inbreeding co-efficient is 4.4%. 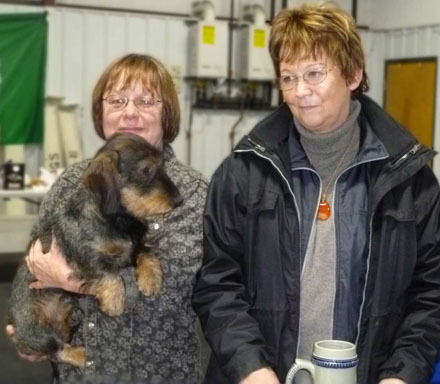 Above - Sky got "Excellent" rating for his conformation and was "Best in Show" at the small Zuchtschau in November 2012.